Another of the notorious "Taito Four", but easily my favorite of the bunch. Little Samson has you playing as the titular Samson, a mountain-climbing kid who throws bells (just... go with it) and his three companions as they attempt to free the land from an evil prince. Your companions lend the game quite a bit of variety, as each one has different abilities to utilize - Samson can climb walls and even up onto ceilings, Kikira the Dragon can fly for short distances and charge her fire breath into a deadly torrent, Gamm the Golem moves slowly but hits hard and can cross spikes without being harmed, and KO the mouse has the lowest health, but can fit into narrow openings, climb walls and ceilings and drop deadly bombs that, when well placed, can even eliminate bosses in short order. 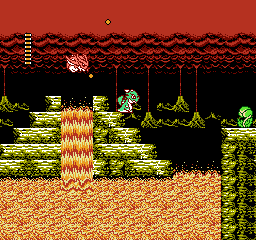 Also notable are the game's visuals, which sport an amazing amount of detail for an NES game, looking almost photorealistic in places save for the limited palette. 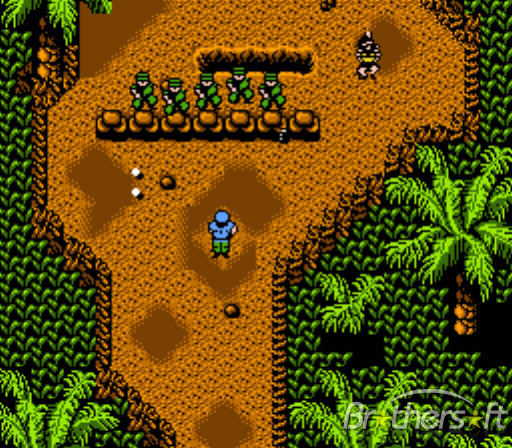 Named "Guevara" in Japan and appropriately starring Che Guevara and Fidel Castro as they waged a two-man battle to liberate Cuba, SNK (quite wisely) decided to remove all real-life references when they brought the game to America in both arcade and NES form. 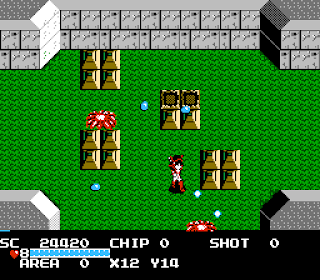 The arcade version of the game featured a rotary joystick that allowed the player to move in one direction and fire in another at the same time, something they attempted to recreate in the first two Ikari Warriors games on NES with pretty terrible results. Thankfully, the port of Guerilla War abandons this idea and just has four-directional movement and firing, as well as considerably quicker gameplay speed. It's great, fast-paced fun, especially with two players blowing up everything in their path. By far the most well known and beloved of the NES Double Dragon games, and for very good reason. Not only did it restore the two player cooperative play that the original sorely lacked, but it was also just a damn good beat-em-up. 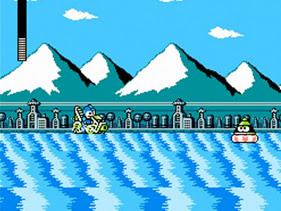 Enemies were much more varied and challenging than the original game, and there were even some tricky platforming sections mixed in to keep you on your toes - my favorite being the big steamroller contraption you had to climb up while avoiding bursts of steam and trying not to get run over (pictured). Hell, I dare say the game even surpasses its arcade counterpart by adding in more stages and having a running plot throughout, even if it does get a bit goofy near the end (with Marion being resurrected through a literal deus ex machina). Widely credited as the game that single-handedly saved console gaming, and it's not an inaccurate description - at the time, people were losing faith in video game consoles thanks to a growing influx of lousy half-assed titles and moving en masse to relatively inexpensive computer games instead. 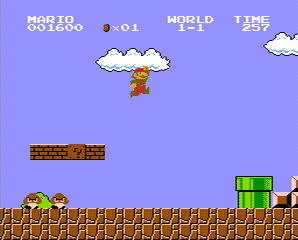 Then Nintendo's new console came along, bringing with it a well designed, fun, colorful platformer with some challenging stages and a wide variety of enemies and secrets to discover. It became a runaway hit overnight, pushed Nintendo to the forefront of the gaming consciousness and continues to sell well to this day across various formats, only recently being upstaged as the best selling game of all time by Wii Sports. So yeah, not only was it instrumental in pulling console gaming out of its rut, it set the standard for every platforming game to come, and one could argue it also led to the invention of non-linear, secret laden platforming games like Metroid. If you haven't played this one and loved it, then turn in your gamer card immediately - you don't deserve to call yourself one. The second in the Bionic Commando franchise (following the arcade title of the same name), this game sounds like the worst idea ever on paper: A platformer where the hero can't jump. However, once you actually play it, you'll find a game of considerable worth. 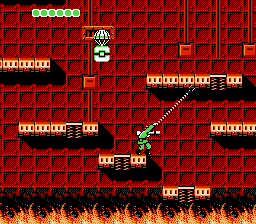 Sure, you can't jump at the press of a button like in many NES games, but in exchange you get a cool extending grappling hook arm that enables you to grapple onto almost any ceiling, climb onto higher ledges, swing over spikes and obstacles, and even stun and knock back enemies. You'll often have to utilize this to circumvent large pits or spike traps, with well timed grab-and-swings being key to making it across. Some sections will even have enemies attacking as you do this, so every move you make has to be carefully planned and perfectly timed. Boss battles are no exception either, requiring you to quickly maneuver rooms and get shots in on the bosses' weak points with very small timing windows. A very tricky game for beginners, but also extremely fun and rewarding once you're accustomed to its mechanics. Considered something of a predecessor to Capcom's long-running Resident Evil franchise, Sweet Home is a horror-themed RPG with some elements of an adventure game - you'll battle monsters in a Dragon Quest style first person narrative while exploring the mansion, uncovering clues and clearing obstacles from an overhead perspective. 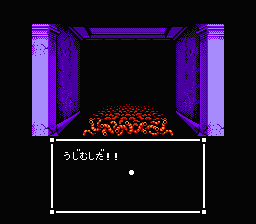 It also succeeds in presenting an unsettling atmosphere, complete with a consistently eerie soundtrack and even some gruesome and creepy imagery for an NES game (pictured: the player being attacked by a hallway full of carnivorous worms). There's even a surprising amount of gore for an 8-bit title, with gruesome decayed enemies and even graphic death scenes for the playable characters should they fall into a trap or be slain by enemies. A game mostly unknown to the western world, but it shouldn't be because it's great. 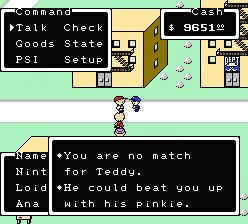 The predecessor to the legendary SNES RPG Earthbound, which was planned for a US release and even fully translated to that effect but ultimately never saw the light of day because it was deemed "unprofitable" in light of the SNES' release. Which is a shame, as it's a fun game with some quirky atmosphere and design. Unlike many RPGs of the time, this one was set in a modern era, complete with modern weapons like baseball bats, frying pans and yo-yos and psychic powers in lieu of magic spells. Even the enemies are a clever subversion, featuring aliens, runaway trucks, stray animals and yes, even crazed hippies. While it does have a few faults that prevent it from joining the ranks of other top-tier RPGs (most notably an unreasonable encounter rate and some very steep fluctuations in enemy difficulty), it is at the very least an unforgettable and unique experience. Plus it did spawn two other fantastic titles in Earthbound and Mother 3, so hey, take the good with the bad and enjoy this overlooked gem. An odd combination of gameplay styles that turned out to make for a pretty damn good game. Guardian Legend is more or less a combination of an overhead adventure game and a shoot-em-up with some light RPG elements on top. Roughly half of the game is spent exploring "the Labyrinth" in order to collect weapons and character upgrades, but also to unlock the numerous corridors. Entering the corridors changes the game to an overhead shooting perspective where you put your collected weapons and upgrades to good use fighting swarms of enemies, as well as the game's very challenging bosses. As per Compile standards, these sections are fast paced and intense, and the sheer variety of weapons at your disposal ensures that there's plenty of ways to approach any given battle.